I probably should have titled this post "GOODBYE Death Row Brownies"! For some reason, my husband and I had a conversation a few years ago about what our last meal would be if we were on death row. To be clear, neither of us has plans to be on death row...ever. 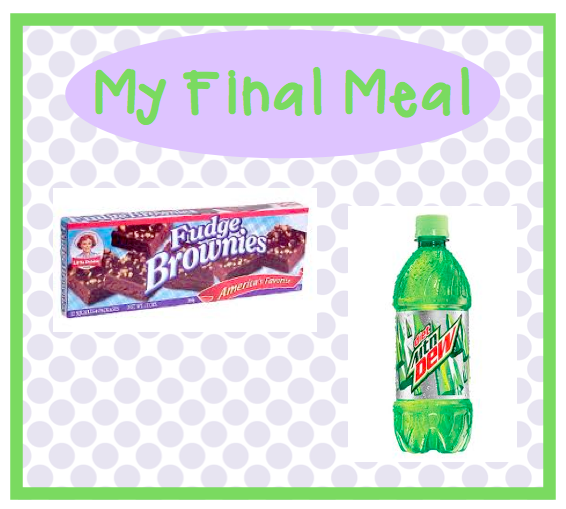 But, we have our final meal menus ready just in case. Yum! I call them gas station brownies, because you can buy them at almost any gas station in America (you just have to check for freshness). When the news broke that Hostess was going out of business, I nearly had a heart attack...until I remembered that my death row brownies were made by Little Debbie. I've talked about my love of Dt. Dew so many times before that I'm sure you are not surprised that it made my menu. Today, on a regular Wednesday...I must throw away my Death Row Brownies. During the school year, my fitness plan is more like a survival plan. It includes random 2 mile runs (every few months), daily dog walks (which don't seem to be very helpful in terms of weight control for me) and an abnormal amount of death row brownies (and Swedish Fish and maybe some other stuff). I'm turning 40 this year. I'm on an upward slope - on the scale. This can not go on. Now that I finally finished school, I'm back on my summer workout plan (which includes 3 mile runs at least 3 times a week and lots of dog walks and bike rides in between. Still, I must say goodbye to my Death Row Brownies. Booo! Off to run. Then tomorrow (when the detox sets in) I will follow this plan (thank you, Pinterest) for my "off days". I linked it to the blog that Pinterest links it to, but I can't seem to find it on her blog. I will survive without brownies and Swedish Fish in my life, right? Please don't suggest that I should give up the Dt. Dew too. I only drink one a day (unless we have a staff meeting) and I just can't do without that for now. Pathetic, but true? Just in case you are wondering, my husbands menu includes only one item (in mass quantities). If he had to choose a last meal his meal would consist of Bezeau ribs (no need to google it, they are ribs made by our friends). Wouldn't it be a nice compliment if someone chose your cooking for their last meal? Considering my cooking skills, it would be a miracle. Anyone else working on a fitness plan this summer? I might need a support group. I try to eat consistently well throughout the week and then eat what I want on Sundays. Good luck with your plan! I am turning 40 next month! My fitness plan totally lacks in consistency! I'm not a good eater either. And now that summer is here, I'm totally loving a good bowl of ice cream! I have good intentions, but I mess up daily! I'm working on my Master's right now so I need a Coke to survive class and the work involved (or at least that's my excuse!). Good luck with your plan! 1. I too, have a love for gas-station pastries--my vice are those hostess pies. Peach is my favorite. My Dad loves them too and when I was a kid and we would run errands he would pick one up for us to split. Alas, they definitely should not be finding their way into my current "clean-ish" eating diet. Boo on THAT! 2. The death-row meal conversation sounds just like something my Hubster and I would talk about. One of our best convos was "If you could only listen to 5 songs for the rest of your life". That was tough! 3. I am also resolving to get into a fitness routine this summer. I love that 100 workout! While I don't think I'm at the point where I can run for 10 minutes (that's a goal for me, though), I can do 10 or more on the treadmill- I'm going to modify. I live within seconds of my gym. I have NO excuse not to go! My plan for the summer was to try to get healthier and lose my baby weight. Well, so far the plan isn't working. I think I just LOVE food too much. lol. It is hard to get in a workout with a 4 year old and a 4 month old. Good luck to you!!! I turned 40 this year, so I'm right there with ya! You've inspired me to get off my bum and get some exercise! This whole post cracked me right up! I am with you, with you, with you! Except...I'm 40+2. Well, I read your post as "Death Row Bunnies". I think it's time for bed! 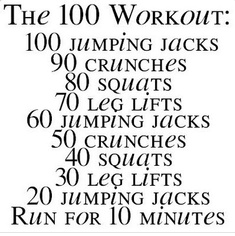 I like this 100 work out though!